Hot summer days call for a sweet, refreshing treat. 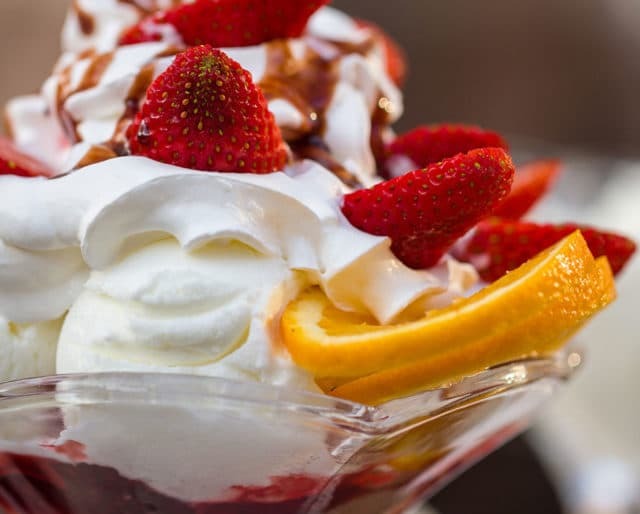 National Strawberry Sundae Day is July 7 and there is no better way to escape the summer heat than with this delicious dessert. There are many U.S. cities that still battle over claiming stake as the birthplace of the sundae in the late 1880s, but one thing is for sure, the sundae is an American favorite. Summer days are for enjoying the nice weather with your family and friends. Invite people over for an evening full of homemade strawberry sundaes! Have each quest bring their favorite topping for an added variety of fun. The best part of a strawberry sundae is the strawberry syrup. Dust off you grandmother's recipe book, or simple use one of our favorite recipes, to cook up your own sticky and sweet confection. The fresh berries make the syrup so much better than the store bought ones. Kick off the weekend by putting together a "Strawberry Sundae Funday" themed happy hour at work. This is a fun way to continue the fun from the previous holiday weekend and gets everyone excited for the weekend! People are always looking for fun ways to stay cool during the hot summer days, and strawberry sundaes are one yummy treat that helps achieve that (while also taking care of that sweet tooth). Who knew that eating a sundae could help you with your daily vitamin intake? The strawberries in your sundae will add to your daily dose of vitamin C intake, making it much easier for you to indulge in this fruity creation. Chocolate and caramel sundaes can become a bit too much after a few spoonfuls. The strawberry sundae provides that perfect balance between the candied sweetness and tartness that strawberries offer.